Proven Delta features such as low end power, responsive pivotal turning, endless lofty hang time, effortless relaunch and unbelievable range are matched with C kite predictable power and uncompromising stability. The three strut design of the Open Delta C delivers smooth efficient power through the stroke and offers a light weight balanced build for maximum flight stability. Our industry first pulley-less bridle lends itself to a direct feel, enhanced responsiveness, and unmatched upwind performance. The range on the Rally has been optimized for maximum low-end grunt. 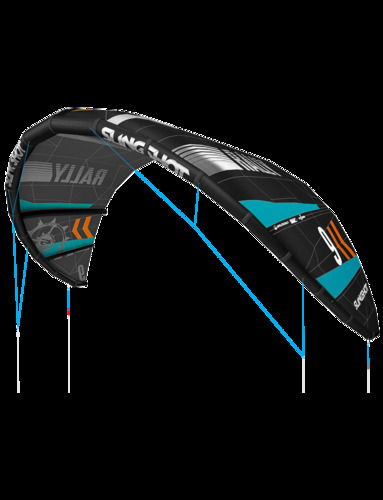 This means riding in lighter wind speeds with smaller size kites and noticeably bigger boost with longer lofty hang times. The stroke at the bar combined with our pulley-less bridle lets you tap into a top end range that translates into complete control when the wind picks. Fine tuning the Rally is easy with Custom Fuel Injection attachment points. CFI alters the overall feel and bar pressure enabling you to tune the kite to meet your personal riding preferences. New for 2012 will be the addition of a 9 meter for ultimate quiver building potential and added Ballistic Aramid scuff guard reinforcement to prevent wing tip wear. As always with Slingshot, the quality of this kite looks great. It's a wave/freeride kite with an easy power control. This Slingshot Rally is a good choice for waves and freeriders looking for a little bit of comfort. It's a so-called 'sheet & go' kite, which means that when you pull the bar you'll receive immediate kite power. One point of attention we would like to focus on is the reduced steering reaction with slacked lines. We advise to play a little with its settings to increase the reaction. Compared to its 2011 predecessor, the 2012 Rally appears to possess more depower and is a little softer in its power buildup. 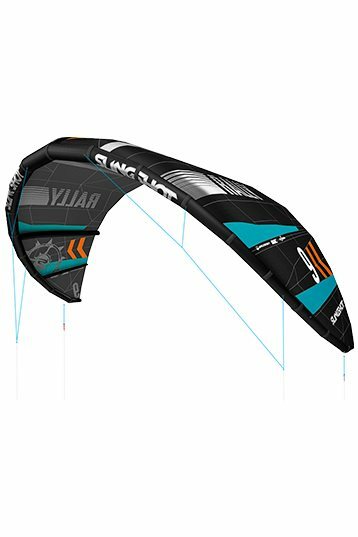 Because of this gradual power buildup, stability, feedback and phenominal relaunch this kite is an excellent choice for beginners. Don't worry too much about this kite's speed: push the bar away a little and the power is gone. Suitable for whom? Beginners and wave riders looking for a sheet & go kite with a friendly character. big difference powered or depowered, depowered less direct action. Powered very direct! The depower is not so easy to activate while on the move. The depower is a line down at the chicken loop and sometimes jams into the cleat. a way to help this is locate the depower line above the cleat and pull this down then pull the depower through the cleat. Relaunch is superb and is brilliant for learning. You can drop the kite down onto the water and relaunch at will, this allows you to adjust foot straps without having to fly the kite all the time. Be aware that once the kite has moved off the zenith,it will quickly fly toward the ground with no bar input. Self launch and self land are both relatively easy. I Learned on this kite in the UK, and in Perth AUS. The kite comes into it's own when riding waves or doing a downwinder. I've riden the 8m rally in North Sea at Ameland and at Workum Lake IJssel, both 2 times with 5 bft avg winds in choppy and small wave conditions. This kite can do it all. I'm pretty heavy but the low end grunt this kite brings just pulls you through when the wind doesn't. Very easy to (re)launch, fly and ride! On the waves going downwind and downstream with little pressure in the kite it still does what it is told, even if it is to fly backwards.. This is your wave slave! On jumps its pretty explosive, not as much as rpm or fuel but still enough to give you that rush AND a long flight after take off. Besides that, Slingshot's bomb proof rep applies on this kite and it can take a beating. My best buy ever! Correction.. i said "My best buy ever" I didn't buy this one, my girlfriend did!